In high school biology, a small amount of time is spent on the topic known as ecology. Most students study this subject to pass a test, but few realize the real life ramifications of this topic when it comes to optimal health. It is estimated that the adult human body is composed of more than 10 trillion cells, but is inhabited by more than 100 trillion microbiotic organisms including bacteria, yeasts, and other single celled creatures. To paraphrase the comic strip character Pogo, “we have found the enemy, and they are among us.” Ecology is defined as the branch of biology concerned with the interrelationships of organisms and their environment. Applying this definition to everyday oral health can give us an understanding of why some folks are more or less prone to the ravages of cavity disease and gum disease. The basic relationship of ecology is a host (you and me, i.e. human species), an agent (our microbes), and suitable environmental factors (water, nutrients, and acid-base balance). When the ecology of our mouth is in appropriate balance, we consider our microbial partners to be beneficial. When the ecology of our mouth is out of balance, we consider our microbial partners to be pathogens, i.e. capable of producing disease reactions by us as the host. This involves our heredity and the genes that make up our specific genetic expression. About 10% of our DNA is devoted to coding-specific proteins that either serve as anatomical building blocks or serve as enzymes that regulate our metabolism and growth/repair biochemical reactions. The other 90% of our DNA serves to code for proteins that either turn on or turn off genes, that allow for appropriate or disproportionate expression of regulatory genes. Up until recently, our genome could not be changed, but with the use of advancing technologies, research is changing this factor experimentally. The second factor is the relative composition of our resident microbial species. When beneficial species of microbes successfully compete for nutrients and places to live on their human host cells, health exists. However when conditions change in the oral environment, such as increased sugar consumption, increased dry mouth from medications or age-related decrease of saliva gland function, use of alcohol containing broad spectrum mouthwashes, use of broad spectrum antibiotics either prescribed for an infection or consumed as antibiotic treated meats and poultry, or lack of appropriate daily oral hygiene, the composition of our resident biome shifts to opportunistic species and ultimately to pathogenic species, resulting in disease and dysfunction. The third factor involves our host dietetics and fluids consumption. It is estimated that the average adult American consumes more than 100 pounds of sugar annually. Some of this consumption is the result of using granulated sugar to sweeten everything from our morning coffee to adding sweetness to breads and pastries. But much of our sugar consumption comes under pseudonyms like dextrose, high fructose corn syrup, cane sugar, agave, and honey to name a few. When we increase the amount of sugar we consume, this tends to shift our resident microbes from mostly beneficial to increasingly detrimental. Additionally, the amount of water equivalent that we consume daily modifies our acid-base chemistry which regulates all of our host biochemical reactions. Enter prebiotics, probiotics, and alternative natural sweeteners. Probiotics are orally administered preparations taken daily over many weeks which contain billions of beneficial bacteria composed of multiple strains that tend to crowd out detrimental bacteria and return the numbers of beneficial bacteria to health promoting numbers. Probiotics can be derived from natural sources such as fermented foods and yogurt or from commercially available preparations. And although natural sources would be the preferred choice, the levels of bacteria present and the variety of strains are limited. Alternatively, many different preparations are available in pharmacies and health food stores. The best contain no gluten or soy, are refrigerated, contain four or more different strains of beneficial bacteria, and report more than 1 billion live bacteria (cfu’s) at the time of use. However, probiotic bacteria need nutrients and attachment sites, which bring the need for prebiotics. These are foods and preparations that support your healthy bacterial species and that contain high levels of fiber such as bran, fruits and vegetables. Alternative natural sweeteners give us a natural way to get the sweetness we crave in our foods without the bacterial growth promoting capabilities of sucrose (sugar) or its excess calories. Some examples of alternative natural sweeteners include erythritol, mannitol, and the five carbon sugar alcohol derived from the birch tree called xylitol. Xylitol is 6 times sweeter than sugar, comes in multiple forms (granulated, powdered), is bacteria-static (i.e. inhibits bacterial growth), and can be used by diabetics and prediabetics to help regulate blood sugar. 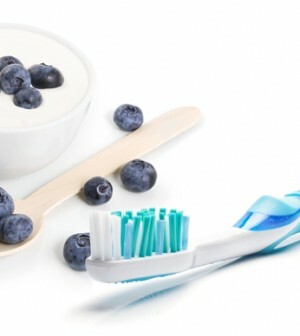 So, remember your basic ecology: create a healthy balance for optimal health and reduce your risk for cavities and gum disease by incorporating prebiotics, probiotics, and alternative natural sweeteners in your daily health promoting regimen. Submitted by Kevin H. Norige, DMD FICD of South Windsor Smiles. (860)644-0113 SouthWindsorSmiles.com.